Everyone loves to celebrate, or at least I think they do. That is why we are celebrating 5 days for our JD anniversary this year. Dr Brad and I opened Johnson Dermatology on August 1, 2006. Thank you to Lynne and Shelly who have been with us all 12 years. Thank you to every team member who has been with us, is with us now or will be with us in the future. Thank you to our team members and our families and friends for a great celebration last week at Alma aquatics park. Thank you to every single patient who has trusted us, trusts us now and who will trust us in the future with the care of your skin. Thank you to John Craig who was at Simmons Bank and is now at Bancorp South for approving us for the loan to open our business…especially since 2 other banks told us we were too high risk. Thank you to the medical community who included us and sent us patients and continue to send us patients. Thank you to the community groups and businesses who allowed us and continue to allow us to speak at an event to or be a part of their group. Thank you to everyone one of you who takes the time to read Nina’s the skinny on skin blog, even when I get to guest blog. Anyway, we have a lot to celebrate at Johnson Dermatology and we can’t stop the feeling yet. Have you seen our 10 year anniversary video..I know it was 2 years ago…time flies. Thank you to Regan and Mona Jones for our video. This year the team led by Nina, Shelly, Dani, Margaret, Brooke, and Sarah Jane have decided we need to celebrate big with 5 days. Also EVERY elite member who comes to the clinic this month will be given a special gift and the chance to win one of the 75 special gifts that are valued up to $1000. 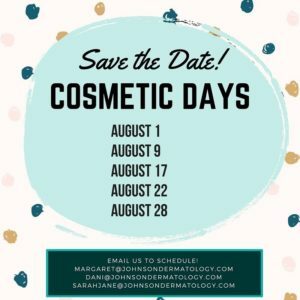 We will have special guests on the 5 cosmetic days for any patient to meet. There are lots of unadvertised specials and goodies. They are correct, we have so much to celebrate. Here are a few of the things that we are celebrating. …You trust us with the care of your skin. … Drs Nelson and Brad performed more than 2500 skin surgeries last year. …Our Dermatopathology lab led by Dr Amy and Lisa are able to get you good answers to your skin condition. …Honey is a certified dermatology physician assistant who is a national expert and speaker for the treatment of psoriasis. …the JD clinical trials team has performed more than 50 studies and is led by Crystal, Christa and Lara to provide free care while advancing science. …our Elite members have received lots of free treatments and savings in addition to concierge level personalized care. …JD is a leading laser practice in the country with more than 10 devices. The JD laser team led by Alice, Sonya and Patience takes pride in getting you great results in a comfortable environment. 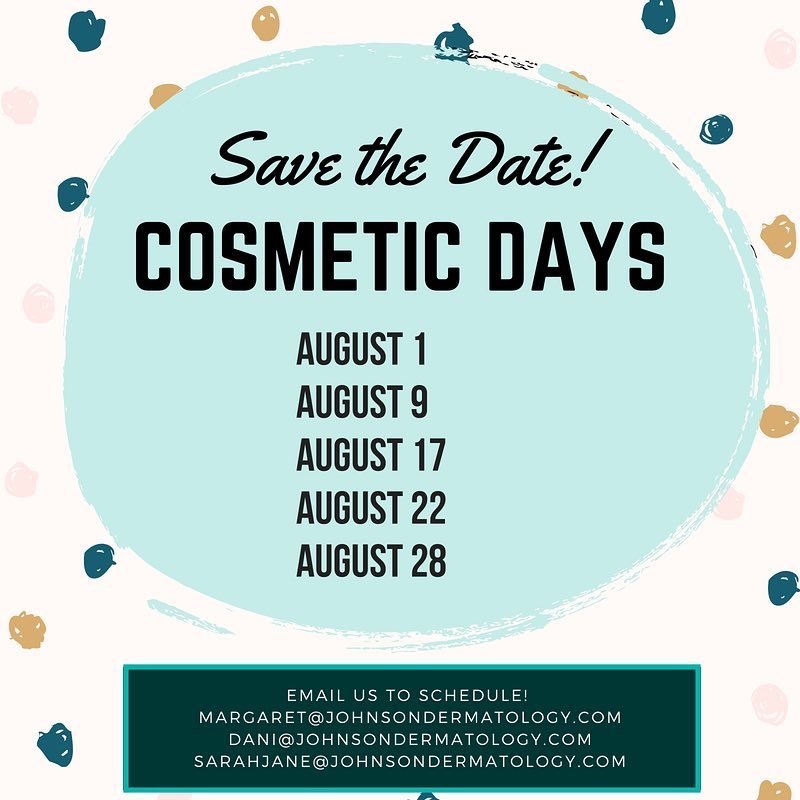 …the JD cosmetic team led by Nina has been recognized nationally by Allergan (who makes Botox and Juvederm) as a top 250 practice in the country. Allergan even invited Dr Sandy to be the only physician speaker at their national meeting this year. …the JD skin care education team has been trusted to research new products. We know that you can purchase skin care products anywhere including Target, Amazon, Sephora, other medical offices. We take pride in providing products with great ingredients that we use personally. We also take pride that we are not sales people but are your skin care partner and educator to help you use skin care products to maximize your results. My daughter Anna had a recent skintastic skin care consult and make up session with Brooke to help prepare for her sophomore year of high school. …the JD team worked with many local businesses and groups to increase awareness of the importance of skin care. Thank you to the local schools, UAFS, Reynolds cancer support house, the Purple Plume, Hazels Haven, Roots hair salon, Hanging City, Fort Smith Chamber of Commerce, Doug’s, Mercy, etc. …JD has been recognized by the readers of eFort Smith and the SW Times Record as the best dermatologist and place to get skin care. …the JD team is extremely thankful and grateful for you. Come celebrate with us and let us help you feel more skintastic. If there is anything else you would like us to offer or if there is anything you think we can do at JD to be better, please let me know. Make sure you repeatedly check out our Instagram, Facebook, YouTube and website as well as come into the clinic to stay current on all of the celebrations at JD. After all, doesn’t everyone love a party?